Let’s celebrate with colorful salads, shall we? 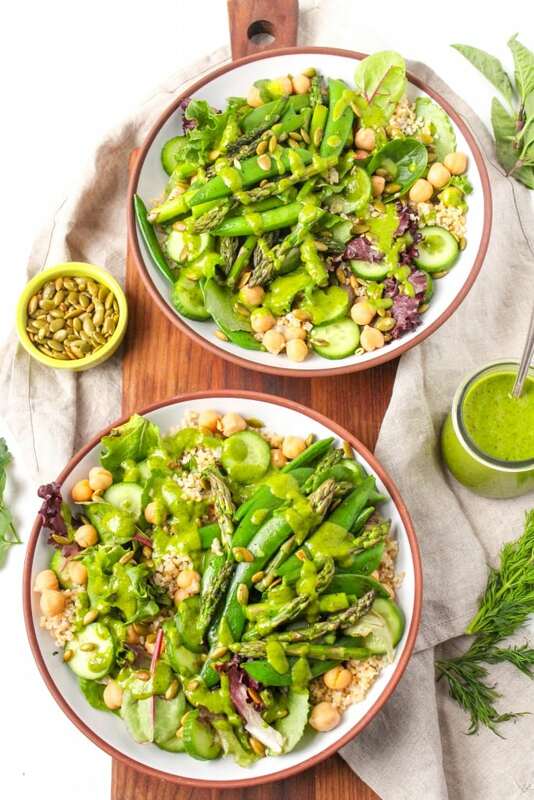 These bright, refreshing, and nourishing green goddess bowls with raw honey herb vinaigrette will be your new favorite lunch. 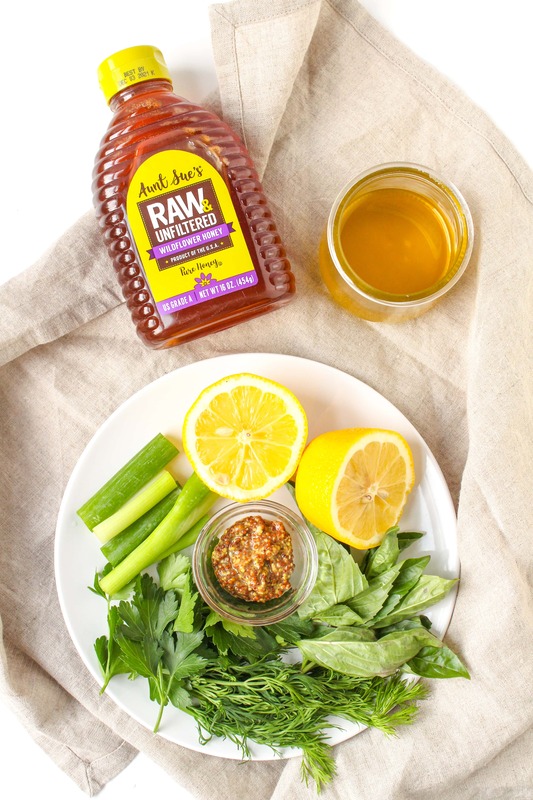 Thank you to Aunt Sue’s Raw & Unfiltered honey for sponsoring this post! I’ve always loved Goddess Bowls, which as far as I can tell are just a fancier name for a hearty, filling grain salad bowl. 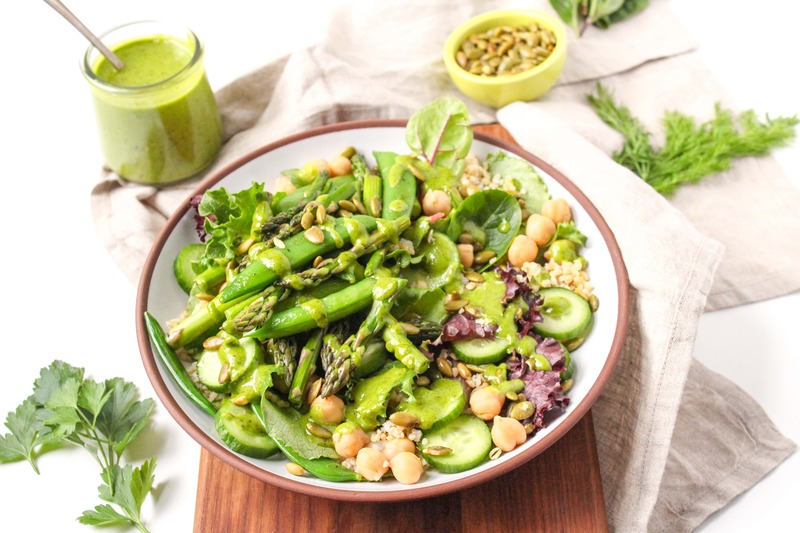 So now that it’s officially spring, I thought it would be nice to share a really colorful and green grain salad to match the colors appearing outside! Because sad and boring salads are just not okay, my friends. 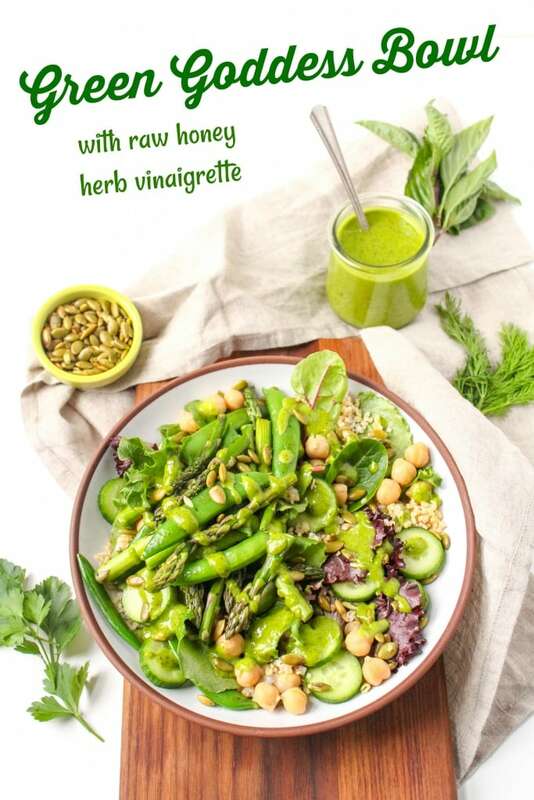 The real star here, though, is not the grain salad, but the bright and refreshing raw honey herb vinaigrette, which is made with Aunt Sue’s Raw & Unfiltered honey. Aunt Sue’s U.S. Grade A honey is 100% pure and minimally processed, and is strained and not filtered, meaning the natural pollen remains in the honey (and adds antioxidants). Aunt Sue’s Raw & Unfiltered Honey is sourced from their co-op of over 270 beekeepers across the U.S. It can be found in most major grocery stores, or purchase it online! Also, if you’re interested, check out their website to meet some of their beekeepers and hear their stories in their own words. Many members have multiple generations of beekeeping in their families! Green goddess dressing is typically made with mayo and sour cream, but I’ve opted for more of a vinaigrette-style dressing here, while still packing it with fresh herbs to give it that gorgeous green color. The fresh herbs at play are basil, dill, and parsley – plus I’ve thrown in some green onions, fresh lemon juice, mustard (you can use whole grain or dijon), olive oil, and, of course, the raw honey! To make it, you simply blend together all the ingredients until you have a smooth and pretty green dressing that’s ready to make your salad pop. As for the rest of the salad, it’s packed with bright asparagus, sugar snap peas, cucumbers, and greens, and adorned with some bulgur, chickpeas, and toasted pumpkin seeds. Feel free to get creative, though, based on your favorite veggies/grains and what you have on hand! The dressing would go well with other combinations, too. Here’s the full recipe. I hope you enjoy it! 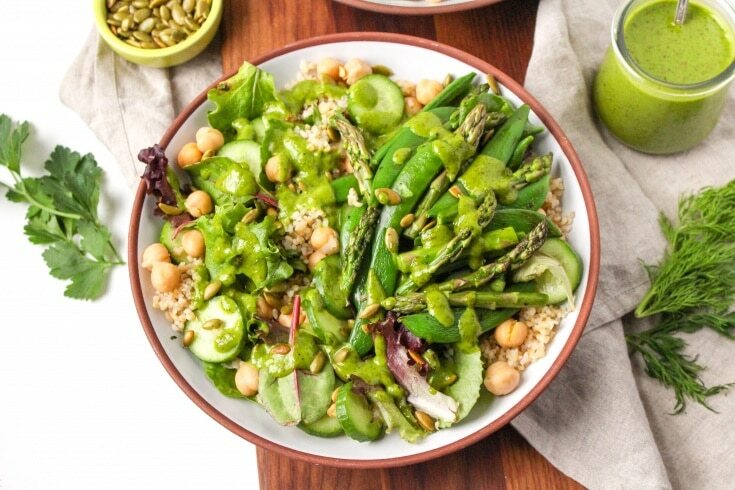 This fresh, bright, and nourishing green goddess bowl will be your new favorite lunch. 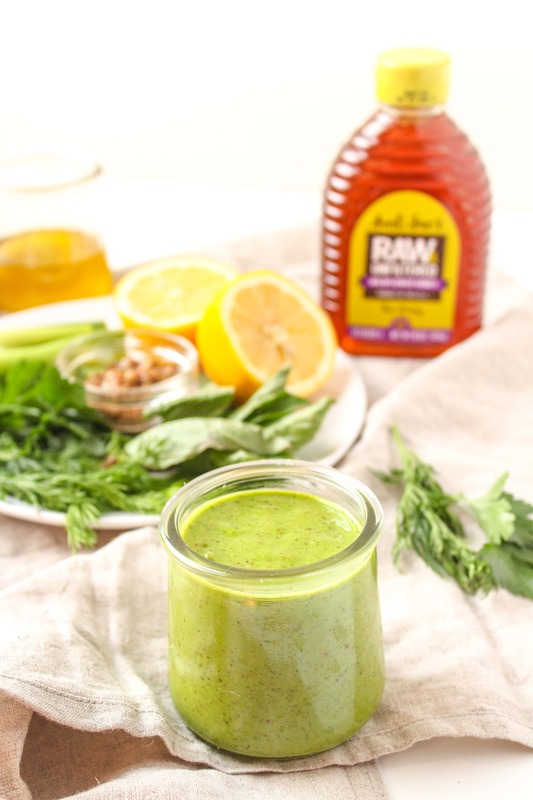 For the dressing, combine all ingredients in a blender and blend until smooth. Set aside. Heat the teaspoon of olive oil in a large saute pan over medium-high heat. Add the asparagus and snap peas and saute for 3-4 minutes, until crisp-tender and bright green. Season with salt and pepper. To assemble, divide the greens, bulgur, cucumbers, chickpeas, and sauteed veggies between four bowls. Toss with the green goddess dressing, then top with pumpkin seeds. Want another way to use the honey you purchased to make this recipe? Try my Pear Ginger Honey Muffins! They make an awesome afternoon snack or a yummy portable breakfast that pairs well with a latte. I really like your salad ideas. This one looks particularly good. Thanks! Thanks – let me know how you like it! It looks really good and healthy. I am definitely gonna try this recipe at home. Thanks for sharing with us. I. How long will this vinaigrette last in the fridge? It should keep for about a week, although in the fridge it will get solid, so place the closed container in a bowl of warm water to bring the vinaigrette back towards liquid consistency when you are ready to enjoy it!